An important parameter that determines whether styrene-butadiene rubber can be used in the manufacture of tires and other elastomeric commercial products is the rubber's compatibility with commonly used fillers, such as carbon black and silica. An increase in the interactions between styrene-butadiene rubber and inorganic filler can be achieved by introducing appropriate functional group-containing polymeric fragments that enhance the polymer's affinity to the applied filler. The invention relates to [bis(trihydrocarbylsilyl)aminosilyl]-functionalized styrene and a method for its preparation. The invention further relates to the use of the styrene derivative in the preparation of a copolymer thereof. Patent for sale or license with royalties. We are open to any kind of partnership or deal. The invention has not been previously offered to market. It can absolutely be exclusively licensed. 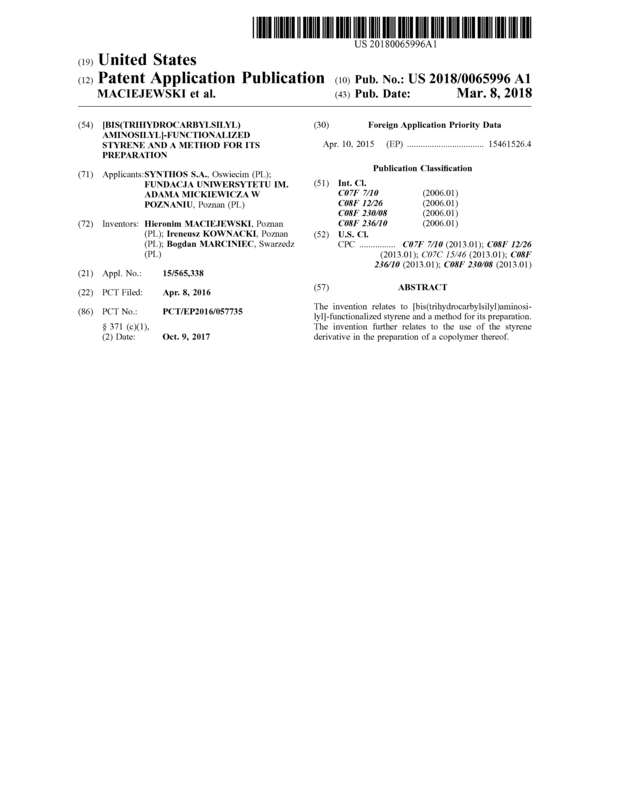 Page created at 2019-04-25 4:01:59, Patent Auction Time.